This pizza has been on our to-make list (well, 8 page document of recipe links…) for quite a while now. We finally got around to making it as one of our last vegetarian meals for Lent. It turned out to be spectacular, ranking up there with Grandma pizza (please, please make this as soon as possible) and our white pizza. First, you make the dough. We tried subbing in 1/3 of the flour with whole wheat flour for a little nutritional boost. The flavor was nice, but the texture was less crispy than using all white flour, so we don’t really recommend that. Thankfully, our most recent Cook’s Illustrated Magazine has a recipe for whole wheat pizza dough that we will try soon! Then, you make a luscious and wonderful white sauce with Parmesan cheese, garlic, and cream. 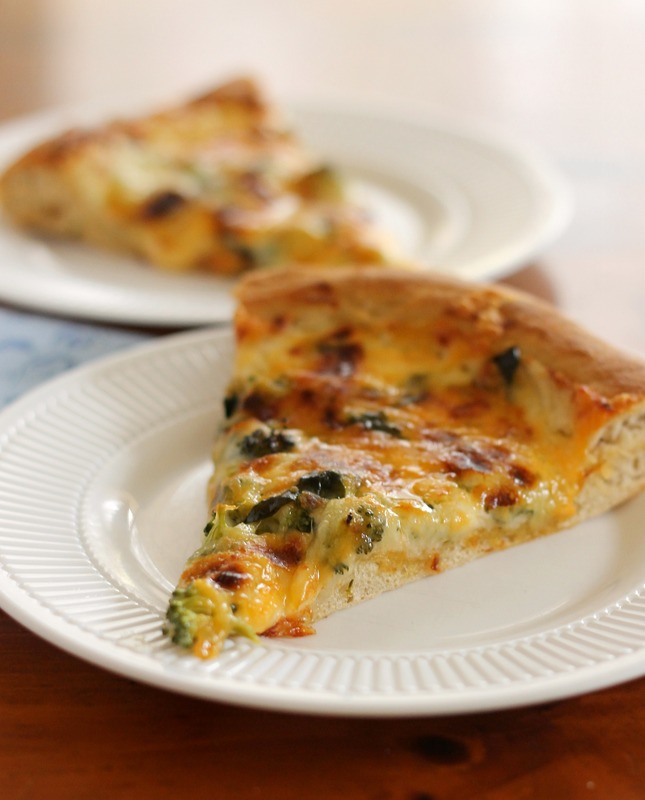 The pizza is topped with mozzarella cheese, cheddar cheese, spinach, and broccoli. It is such a flavorful and delicious pizza that we bet your local pizza restaurant cannot compare to it! Preheat the oven to its highest temperature (ours is 550 degrees) with the pizza stone. Melt the butter in a small saucepan over medium-high heat. Whisk in the flour and cook, whisking constantly, until bubbling and light golden, about 1 minute. Whisk in the heavy cream and garlic, and season with salt and pepper to taste. Cook, stirring frequently, until the mixture thickens and bubbles. Remove from the heat and whisk in the grated Parmesan until completely melted and smooth. Discard the garlic clove. This will make a bit more sauce than you need for the pizza- Annie’s Eats recommends dipping the crust in it, and so do we! Roll out the pizza dough into a 12-14 inch round on cornmeal-dusted parchment paper. Lightly brush the perimeter of the dough with olive oil. Spread a thin layer of the white sauce over the crust, leaving a border clear around the edge for the crust. Sprinkle the torn spinach leaves over the white sauce. Evenly distribute the broccoli florets over the dough. Layer evenly with the shredded mozzarella and cheddar cheeses. Finish with additional grated Parmesan, if desired. 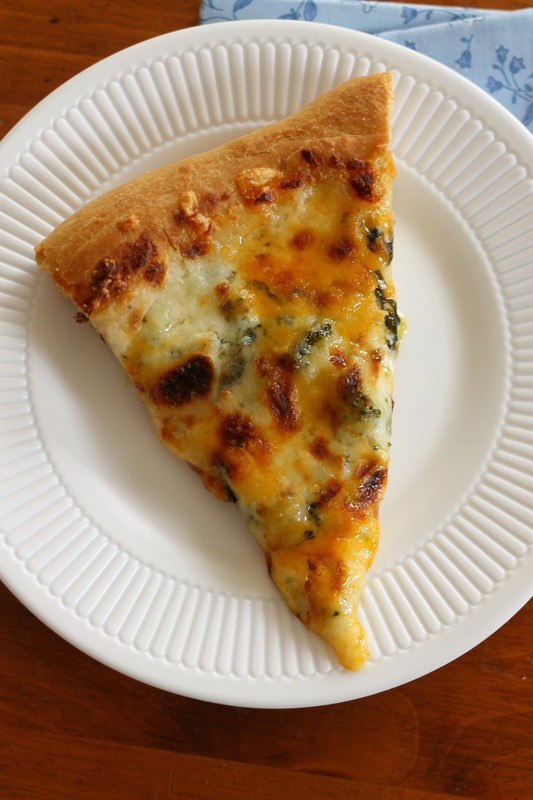 Transfer the pizza to the preheated pizza stone and bake until the cheese is melted and bubbling and the crust is lightly browned, about 10-12 minutes. Remove from the oven and let cool slightly before slicing and serving. Enjoy! Oh, pizza… how I love thee! That slice looks ah-mazing!